Portland, Ore (June 4th)—Dialsmith, worldwide developer, marketer and seller of the Perception Analyzer® audience response tools, has announced the addition of several new focus group facilities to its worldwide affiliate program. 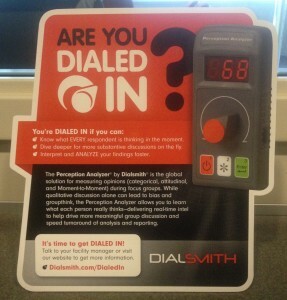 The ‘Dialed In’ program is aimed at making it easy for current and prospective clients to locate and work with facilities that can provide an optimal level of service and support for Dialsmith’s Perception Analyzer tools. Four additional members have been added to the program, covering five key research cities across America and Europe. The new ‘Dialed In’ members are: PVR Research (Atlanta, GA), Observation Baltimore (Baltimore, MD), Fieldwork O-Hare (Chicago, IL) and Viewpoint Europe (Hamburg, DE and Frankfurt, DE). New members continue to be added to the program, which includes a network of more than 30 facilities to-date. A complete listing of member facilities, listed by city, can be found here: http://dialsmith.com/services/affiliate-facilities.html. The Affiliate Program represents further expansion of Dialsmith’s Research Services, which offers clients one-stop shopping in all areas of research and field services, including recruiting, research consulting and facility management. The Perception Analyzer has been the gold-standard audience response tool for capturing quantitative discreet and Moment-to-Moment feedback for more than 25 years. The dial-based system allows you to capture feedback and reactions to any form of test material including concepts and messages, storyboards and advertising, television personalities and programming, political speeches and debates, and more. Researchers benefit from understanding respondents’ opinions and changing perceptions in-the-moment, helping eliminate bias and groupthink. Researchers can view results in real-time enabling deeper and more focused qualitative, follow up discussions. Dialsmith is a Portland, Oregon-based technology company that develops products and services for research, audience engagement and live event scoring. We are pioneers in the development of tools for capturing and displaying continuous and moment-to-moment feedback and are the worldwide marketers, sellers and service providers for Perception Analyzer, Perception Analyzer Online, ISX Scoring and Slidermetrix. Featured on CNN, FOX News, Food Network, ESPN X Games, The New York Times and more, Dialsmith’s Perception Analyzer tools are the gold standard for dial-based focus group testing, public opinion polling and audience engagement. To learn more, visit www.dialsmith.com. This entry was posted on Wednesday, June 18th, 2014 at 5:59 pm. Both comments and pings are currently closed.